OnePlus’s next flagship OnePlus 6 is coming in Q2 this year. Leaks and rumors have already started to come on a daily basis. A fresh new leak has surfaced which reveals almost all the major specifications of OnePlus 6. According to the listing, OnePlus 6 will sport a 6.28-inch FHD+ AMOLED display with 1080×2280 pixels resolution and 19:9 aspect ratio. The display is similar to the OPPO R15. The device will be powered by Snapdragon 845 SoC with 6GB RAM and 128GB storage. Out of the box, the handset is expected to run on Android 8.1 Oreo with Hydrogen OS on the top. OnePlus 6 will sport similar rear camera setup as OnePlus 5T. 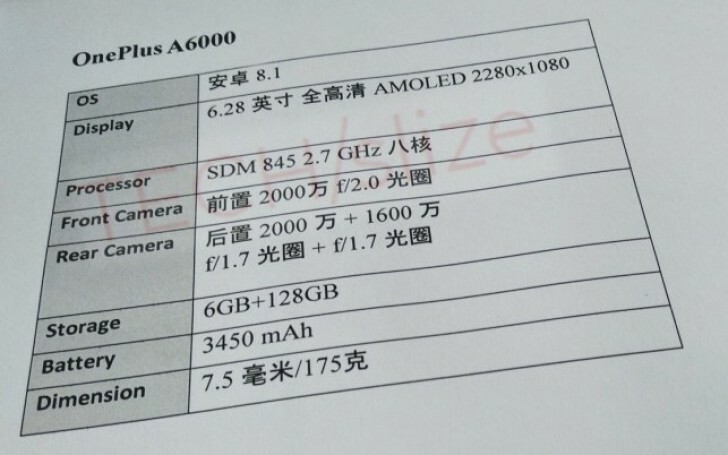 At the back, it will have 20MP+16MP sensors with the f/1.7 aperture for both of them. On the front, it will have a 20MP sensor with f/2.0 aperture to take the selfies. OnePlus 6 will sip its juice from a 3,450 mAh battery. A previous price comparison leak also shows the 8GB RAM variant with 256GB storage. The 256GB storage variant is expected to be priced at CAD 749.